As one of the world’s greatest tenors, Maestro Vezzi, is found brutally murdered in his dressing room at Naples’ famous San Carlo Theatre, the enigmatic and aloof Commissario Ricciardi is called in to investigate. Arrogant and bad-tempered, Vezzi was hated by many, but with the livelihoods of the opera at stake, who would have committed this callous act? Ricciardi, along with his loyal colleague, Maione, is determined to discover the truth. But Ricciardi carries his own secret: will it help him solve this murder? My first read from Hersilia Press and this title (originally published in Italy in 2007) is a great discovery of theirs and with a central character who won the author a writing competition which set him on the path to publication with this series. It matters not one iota if you know anything about opera to appreciate the book and its cast of characters, many of whom are at risk of losing their jobs and livelihoods dependent on the outcome of the investigation. Rattling along and clocking in at a little over 200 pages this is a great read. 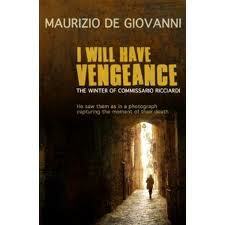 I loved the character of Commissario Ricciardi – a man who carries all of the ghosts of past crimes along with him, haunted by them often as he goes about his investigation in much the same way as they appeared to Bruce Willis in the Sixth Sense movie and with such detailed images in the novel that will haunt me for a long time to come. So, go seek out the tale that has haunted me this week. Order your copy here , or go here to download the first chapter.